1. 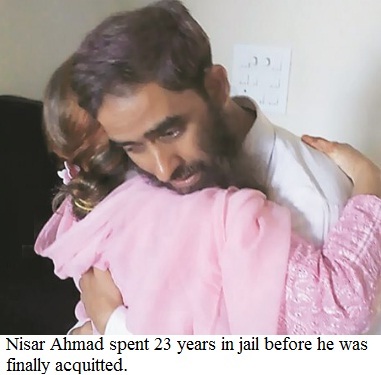 Nisar Ahmad was barely 19 when he was framed in a false case of train bombing. Once arrested, agencies kept booking the college student from Gulbarga, in other unsolved cases and it took 23 years before he got acquitted. 2. Mohammad Amir was just 20. The Delhi youth was picked up by plain-clothed personnel in 1998, kept in illegal detention, tortured and falsely implicated in 19 terrorism related cases. He got released in 2012. 3. In the most recent case, 10 youths were picked from national capital. Immediately, they were accused of 'Jaish-e-Mohammad' links. Media was told that they had terrorist links, they were adequately defamed and thrown in lockup. Had it not been a strong reaction, they might have also had a similar fate. Luckily in this case, the Home ministry acted and 'Special Cell' of Delh police, which is known for such arrests, released them. It was said that they didn't have terror links. So easy it is to detain, arrest, condemn, brand, jail Muslim youths and ruin their lives! It is often said that post 9/11, police and security agencies became more suspicious of Muslims and the community bore the brunt of the 'profiling'. But the cases of Nisar Ahmad and Mohammad Amir predate the twin tower attack. The role of police has been biased during communal riots, and it has been acknowledged by top police officers--both serving and retired, in the past. Unfortunately, it has been very easy for agencies to implicate Muslims, ruin their lives, families and careers. Why cops implicate Muslim youths? By claiming to arrest criminals or 'terrorists', police officials get credit. Headlines like 'mastermind arrested', help police officials within the department. The cops also do it when the heat is on them in failing to solve cases. Besides, in unsolved cases, there is pressure from superiors to work out the case. It is an age-old practice that innocent and poor who don't have social support or financial means, are made sacrificial goats. This helps cops in easing the pressure. Why cops have no qualms in framing innocents, destroying their lives? Further, it takes years before case goes to court. Police use torture to get 'confessions'. It takes years for a case to reach trial and hence cops have no fear of getting exposed. By implicating a person in several cases, they succeed in terming him as 'mastermind' and when name appears in headlines, judges also get affected and are more tough on such persons. Despite torture, doctors examining them, ignore and take no note of the injuries. One of the reasons, this systematic targeting of Muslims continues, is because there is no action against guilty police officers. Cops have nothing to fear. Even after acquittal, the maximum a judge will do is to reprimand the 'police'. No penalty or action on the cops who destroyed lives. The fear of cops stops others from standing for victims. Judges also don't question detainees despite seeing that the person has injury marks or swollen face. Hence, even if there is no evidence, such persons rot in jail for years, in fact, decades. It is a tragic situation in the world's biggest democracy. In a country where Muslims form the second biggest population, the failure of the 'system' in getting justice to innumerable Muslim youths, should have led to corrective measures. Alas, nothing has happened. There are at least, 55 [30+25] Muslim MPs in both houses of Indian Parliament, always. But they have failed to come together, ever, on the serious issue, which concerns all Indian Muslims. While activists from different sections of society raised the issue and Muslim clergy did take it up, there was no collective movement from all sections of Muslims, especially, the political leadership. Individually, some did speak up, but there was no strong stand taken by them. It is a shame that how agencies continue to arrest and some of its officers manage to get away despite such biased action against Muslim youths. There have been documentation of such cases and arrests by Special Cell, Delhi. Yet, this has been happening for decades now. 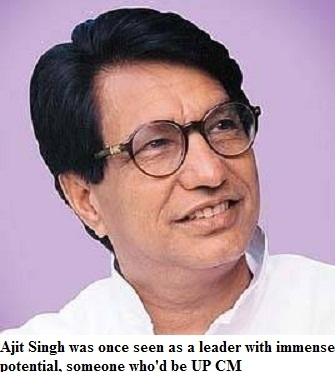 Once upon a time, Ajit Singh, was considered a major figure in North Indian politics. In fact, in late 80s, it was common for people to remark that if not Prime Minister of future, he would certainly be UP's chief minister. After all, he had the legacy of none other than his father Chaudhary Charan Singh, the influential Jat leader who had become prime minister. Ajit Singh was the unquestionable leader of Jats, a community that wield(ed) influence. He also had support of Muslims. However, Muslim support was something he always took for granted. In Janata Dal, he had tiffs with other leaders as he always considered himself a 'national and big leader'. Though Muslims were solidly behind him, he rarely raised voice or stood with them.With the emergence of SP and BSP, Muslim voters got more options. Jat support alone couldn't ensure him victory anymore. Upper Caste leadership was no longer enough for politicians to become CM. While other backward caste leaders like Mulayam Singh Yadav, Kalyan Singh and Mayavati became chief ministers, many times in UP, Ajit Singh, lost the race. He stood nowhere compared to these leaders. He raised the demand for 'Harit Pradesh' because of his 'influence' in the region, but the fact was that he was no longer having influence in even Western UP or his pocket-borough. No one anticipated then, that Ajit Singh, whose father had stitched a rainbow coalition of castes, would end up losing the turf, so easily. While politicians are known for party-hopping, Ajit Singh took it to another level. Ajit Singh was prepared to bargain with anyone and to such an extent that he lost his image and credibility. Though he managed to become union minister often, his influence was waning very fast. RLD [Rashtriya Lok Dal] was no longer a force to reckon in UP. Those who have closely worked with him and were his most ardent supporters, feel the most for him. His fall is an interesting aspect for students of politics, particularly, in North India. While politicians build on legacies and are creating dynasties, Ajit Singh frittered away Chaudhary Charan Singh's legacy. He tries his best to stay relevant but the reality is that he has become totally irrelevant in UP's politics. 24.88 crore families in India: Just 3.12 crore or 31.2 million Muslim families, yet such worries about increasing population of Muslims! The latest Census report has revealed that there are 24.88 crore or 248 million families in India. Among these 24.88 crore families, just 3.12 crore families are Muslim. There are 20.24 crore Hindu families. There are 63 lakh Christian families 41 lakh Sikh households and 19 lakh Jain families. Clearly, Hindu population in India, is huge. While on an average, a Muslim family had 5.6 members, a Hindu family has 4.9 members. However, this has also seen a fast decline. The fastest decline has come among Muslims. In fact, Hindustan Times reported that 'Muslim families shrinking fastest' in India. The size of Muslim family is now getting smaller. Still, right-wing leaders, especially, BJP and VHP rabble-rousers have been talking about 'rising Muslim population' and are fearful of a 'Muslim takeover' and that 'Hindus will become a minority'. Now, if someone is so scared, despite clear data showing number of Hindu families six times the number of Muslim families in India, what can anyone do? 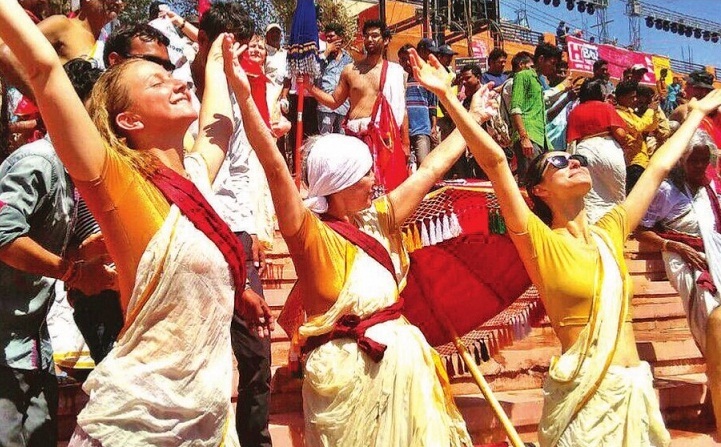 Hindus are nearly 79.8% of India's population. 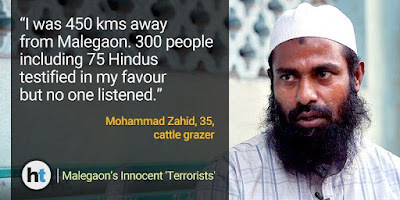 Muslims account for just over 14% of India's population. Census was conducted in the year 2011, the report was released in 2014-15. Since then, Census department has been regularly releasing other details and information too. 120 Muslim lawmakers elected in five state Assemblies in India: Can't elected Muslims exhibit leadership qualities, become leaders in true sense? Over 120 Muslims have been elected as MLAs in the recent Assembly elections. The five states that went to polls included Assam, West Bengal, Kerala, Tamil Nadu and Puducherry. It was an election to elect 822 members of legislative assemblies [MLAs] in these states. India has around 14-15% Muslim population. However, three of these states that went to poll had a much higher percent. Assam has around 37% Muslims, West Bengal has 29% and Kerala has 27%. Tamil Nadu and Puducherry have nearly 6% each. Even in this backdrop, the figure of Muslims elected is not too less, though it should have been higher. Two of these states have 'Muslim parties' too. Kerala has Indian Union Muslim League (IUML), Assam has Badruddin Ajmal's AUDF. Also, SDPI, AIMIM, INL and IUML had contested in Tamil Nadu and other places. There are 56 Muslims elected to WB Assembly [294 member house] on this occasion. In West Bengal, Muslims supported Mamata Banerjee's Trinamool Congress. 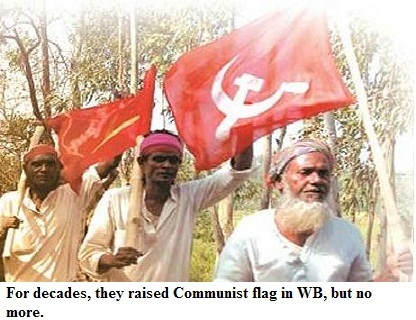 Also, they voted for Congress and Communists [Left] at a few places. In Assam, 29 Muslims have been elected [out of a total 126 members in the house]. Muslim MLAs from Congress and AUDF have won. Also, one Muslim candidate of the BJP has also been elected in the State, this time. 30 Muslim MLAs have been elected in Kerala. In Kerala, Muslim vote was divided between Left and UDF. Though UDF lost, there are Congress and Indian Union Muslim League MLAs apart from LDF. IUML sent 18 MLAs to Assembly including 16 Muslims and two non-Muslims. The strength of Kerala Assembly is 140. Muslim candidates have won in Tamil Nadu and also Puducherry. In Tamil Nadu, winners include from DMK, AIADMK and IUML. Strength of Tamil Nadu and Puducherry Assemblies is 232 and 30 respectively. Frankly, the figure is not bad, specially, when it was felt that Muslim representation may have gone down even more. The fact is that if an MLA works hard, takes interest in area's problems, raises the voice about constituency, he/she can do a lot. The legislator has ample powers to make a lot of difference. Through his leadership, funds, voice in house and on the streets, the legislator can get popular and bring positive change in lives. Can't some of the MLAs do it? Did 70 Muslims MLAs in UP Assembly make any difference? Once again 'numbers' alone don't make a big difference. 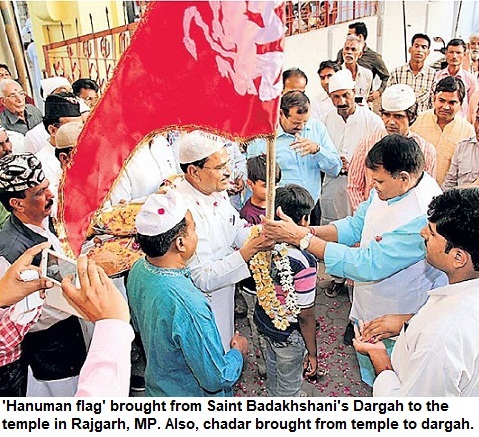 In UP, Samajwadi Party's 65-odd MLAs have made little difference in the lives of ordinary Muslims. Most of them have remained silent, didn't take up issues of education and health, or even the points in the SP's manifesto. Clearly, Muslims need good leadership. MLAs ought to be leaders, on the ground, they must act as social leaders. And not just MLAs of Muslims but command respect from people of all sections because of their work, to become true leader. Else, this talk of numbers is just useless. Muslim girls excelled in tenth board examination in Madhya Pradesh. Nasira Mansoori, a student of Govindpura Girls' school, secured 580 marks out of 600. She secured a place in the merit list [top ten] of the exam--results declared yesterday. Her father sells scrap on his bicycle. Nasira said that often her mother had to borrow money from neighbours for buying her books. The teenaged girl with a twinkle in her eyes says that she wants to study hard to become an officer, so that she can help the common and poor people in the society. 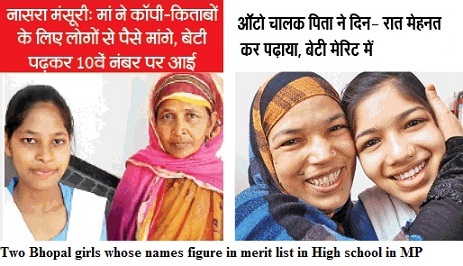 Similar is the story of Saima, whose name also figured in the merit list. Her father drives an auto-rickshaw. She says that her parents worked very hard to save money for her studies. Talking to journalists she said that her family's financial condition was not good, and her parents made a lot of sacrifice, trying to ensure that she got good education. Saima wants to become a medical practitioner, so that she could treat patients from the poor families [like ours, she says], who can't afford to go to good doctors. One hopes that these girls are able to study ahead, and financial constraints [which often cause as a major hurdle] would not come in way, and they would be able to live their dreams. When storm, rains lashed Ujjain once again and pilgrims had no place to stay, local Muslim community opened the doors of their houses. 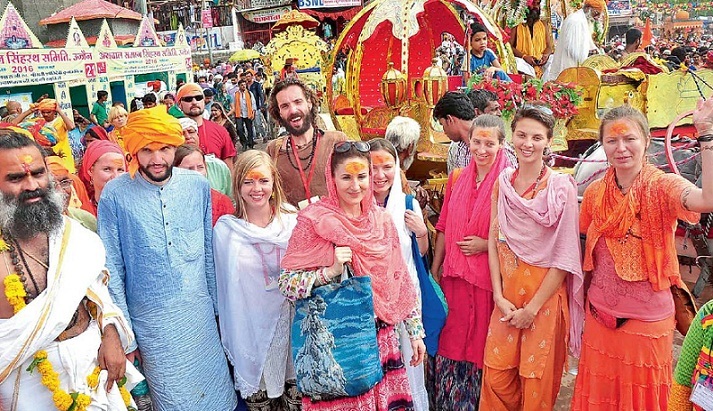 Apart from houses, mosques were also opened for Hindu pilgrims including women and children. 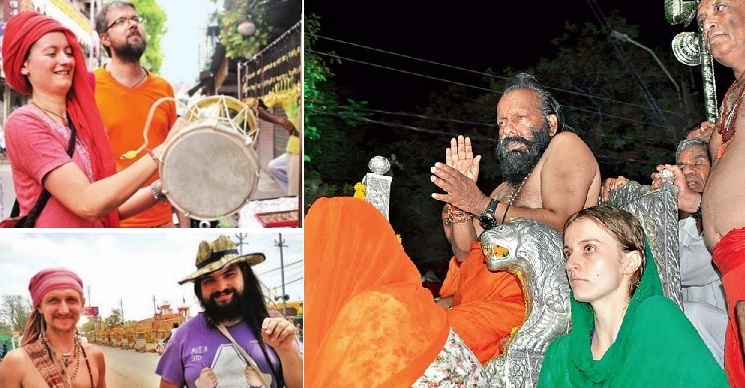 Tens of thousands of pilgrims, mostly from rural areas, had come to Ujjain, for participating in the Simhsatha Kumbha. But repeated rain and thunderstorm made it tough for them. When the storm first hit the city, tents fell down and seven pilgrims died. Then also, local Muslims were engaged in relief works all over the City. When the storm again hit, mosques opened their doors to pilgrims. 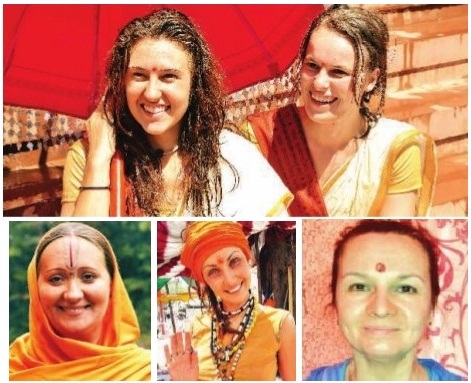 People in other cities who had no contact with their kin who were in Ujjain, later wrote on Facebook about the experiences of their family members. They mentioned how Muslims in the city hosted, took care and provided food and all other arrangements to them. Hindi newspapers also praised the gesture. On front page of the papers, the stories and photographs were carried. Unfortunately, national media--TV channels and Delhi based papers didn't cover the aspect at all. 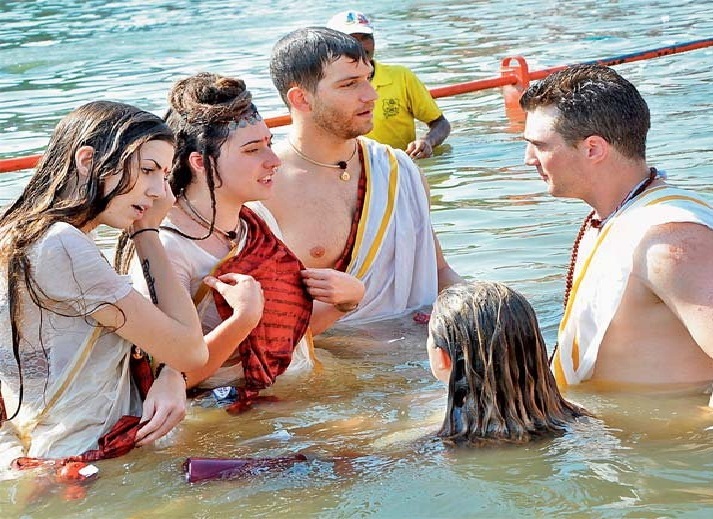 On 'ghats' too, Muslim youths voluntarily served and saved pilgrims from drowning. There were health facilities and water kiosks by Muslims too for pilgrims. In Patrika newspaper, which is one of the largest selling Hindi papers in MP, Lalit Saxena, wrote about 'Mahakal ke bhakton ko mili Rahim ki chhat'. 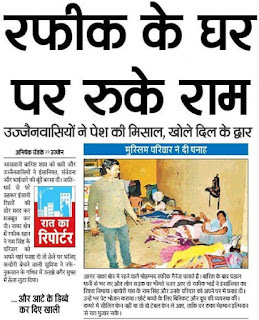 In Nai Dunia, Abhishek Chendke, wrote the story, 'Rafeeq ke ghar ruke Ram' [Ram stayed at Rafiq's residence]. 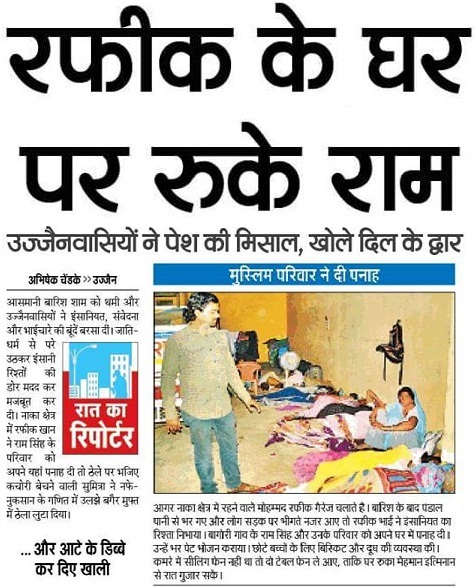 It is sad that Delhi-based newspapers and media didn't report it, though such positive stories should be highlighted. No action against Sakshi Maharaj, Babulal Gaur: Morality, corruption are non-issues for BJP! No political party talks as much about morality as the BJP. But when it comes to practicing it, BJP leaders are farthest. In fact, its leadership appears most thick-skinned while dealing with complaints against its leaders. 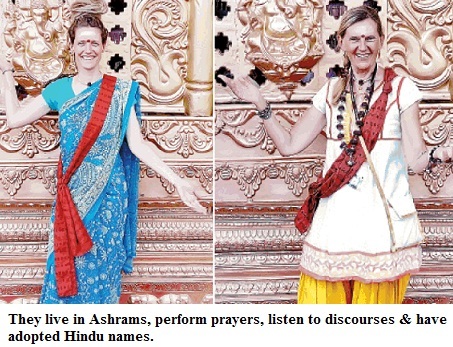 Recently, controversial MP Sakshi Maharaj, got a girl's jeans unbuttoned in front of him. 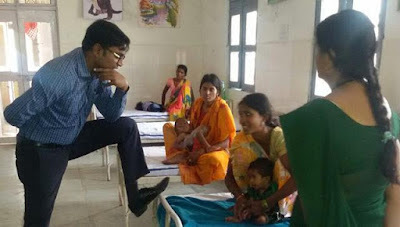 Lot of people were sitting around but the BJP MP wasn't bothered. TV channels shouted a bit, not as much as they do, but still, they raised the issue. There was no response from the BJP. No action till date. But this isn't surprising. Anchors may yell and shout but BJP can't be forced to take action. They do things their way, and they rarely take action against their own party men, even if their action is criminal or offensive. Just a few days back, former CM and current Home Minister of Madhya Pradesh, Babulal Gaur, was seen touching women inappropriately. The video clearly showed how Gaur was touching the women while boarding the bus. One of the women, who is associated with BJP, later quit the party. But no action was taken. It was clearly an act of molestation, but it is BJP government and FIR can't be registered. So complaint was made but FIR was not registered by police officials. The party also took no disciplinary action. The BJP knows that there is a limit to which TV-walas or paper-wals can shout and it isn't bothered much. It knows how much to allow and when to contain, and how. The case of Sakshi Maharaj is also same. Under the IPC, it is a crime and he should have been booked. But he wasn't. There is a SP government in UP. BJP central leadership didn't take any action at all. In a job scam, Haryana chief minister [Chuatala] gets into jail but a scam of the extent of Vyapam, that sees deaths, takes place, and the Chief Minister remains at the helm. Other parties can learn from BJP, shouldn't they? 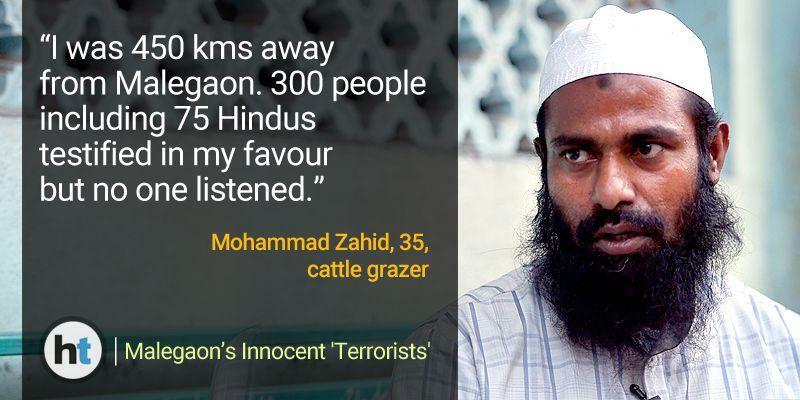 For years, it was known that Maharashtra ATS had implicated innocent Muslim youths in Malegaon case. Still, it took nearly a decade, before they could be finally acquitted and released. In ten years, these youths were tortured and suffered immensely. Their families were affected, the careers and lives were ruined. The latest Hindustan Times report by Harinder Baweja and Farhan Shaikh, titled, 'How Malegaon's innocents lost 10 years of their lives', once again brings to fore the horrific tragedy, the custodial tortures these youths suffered. Is that how a democratic nation treats its citizens? If the police can't find the perpetrators or certain officials want to save the real terrorists, they catch innocent Muslims, and frame them as terrorists. The then officers of ATS who were involved in this frame-up haven't faced any inquiry or action, as yet. Had it not been a sensitive officer like Hemant Karkare, who later took upon the task to investigate the case and painstakingly tracked the gang involved in the act, these youths won't have been released today. In fact, it is the role of Congress that is truly pathetic. Congress was in power at the Centre during this entire period. All agencies were functioning under it. UPA was not just at the helm in Delhi but also in the State. In Maharashtra, Congress was continuously in power. But agencies continued to work on the 'agenda' to frame Muslim youths. How could it happen? 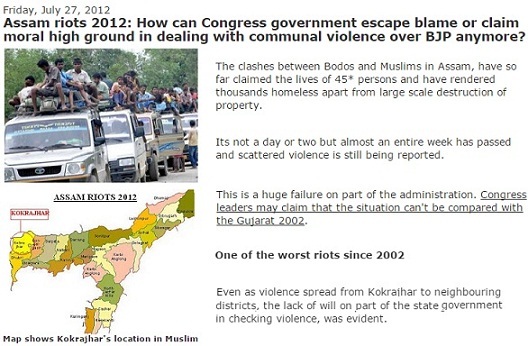 Isn't Congress responsible. Its leaders didn't insist on any audit of investigative agencies and minorities were kept out of IB-RAW. Also, Congress' leaders remained sympathetic to the Hindutva case. Clearly, it is Congress--the self-styled secular party, that is responsible for the plight of innumerable Muslim youths languishing in jails in India. Still, it doesn't seem that the party has learnt anything. In the few states where it is in power, it still seems impotent to act against mischief-makers.